After what must have felt like an endless six months – with regular blood tests and having to take antibiotics with extremely unpleasant side effects – Scot was finally cleared … lifting the heavy burden on his shoulders. 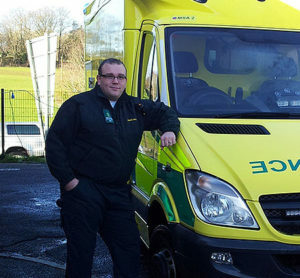 He has since changed employer moving from the private medical sector to the NHS and is back to loving his job. These days the NHS crew’s vehicles are made ready and prepared for needlestick injuries , which Scot hopes should limit the risk of anything like this ever occurring again. However, he still makes a thorough visual check of each ambulance before leaving the station. But dangers lie elsewhere, too. In Scot’s volunteer work with the Search Dogs Sussex, they primarily work in woodland where they sometimes come across evidence of drug use – and the immediate risk of another needlestick injury. 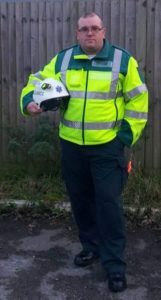 Early in 2018, Scot approached uvex in the UK to see if they would be willing to support the search team with some PPE to keep them safe when out and about. “Up until this point, each individual member funded their own equipment, travel and expenses.” Since then, uvex has donated to the team some uvex quatro pro safety boots and more recently the uvex 2 safety shoes. Each member now also wears safety glasses including the uvex i-works, pheos, pheos CX2, sportstyle and super OTG. For Scot personally, the most important pieces of equipment are his new HexArmor PointGuard® Ultra 4041 gloves that uvex has given to him to try out: “I think they are great,” he enthuses. “They are comfortable and provide me with an increased feeling of being safe whilst working and searching.” He always keeps a pair in the top of his work bag when out in an ambulance and in the pocket of his vest when on a search and rescue mission. After such a terrible ordeal, HexArmor has provided Scot with peace of mind at last. You can find out more about our partnership with HexArmor on our UK website. Thanks for sharing your views on safety gloves, Neoprene gloves provide protection against a broad range of corrosives chemicals. They are resistant to oils, greases, alcohols, resins, alkalis, organic acids, and many solvents. Neoprene has poor resistance to chlorinated aromatic solvents, phenols, and ketones. Even every personal protective equipment is needy things.